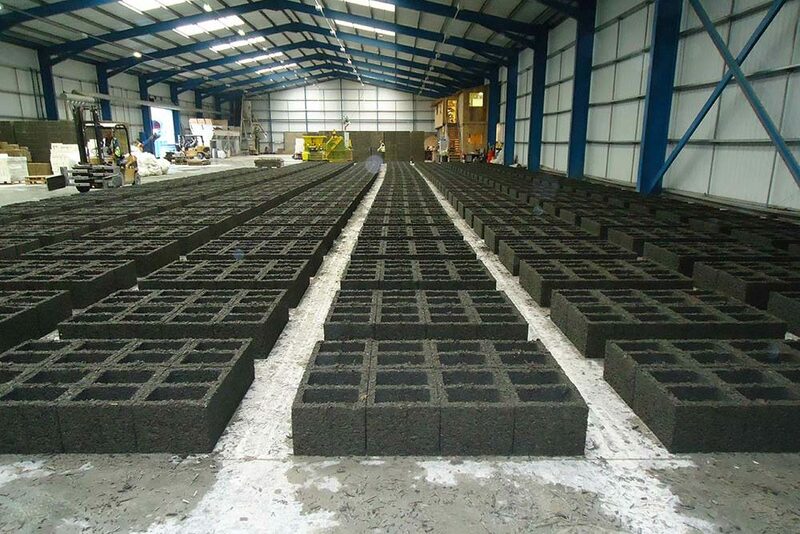 Durisol blocks are manufactured in a purpose built 52000 sq ft factory in Crumlin, South Wales. We source softwood fibre from recyclers who process waste wood. They supply to an exact specification with all foreign materials (nails etc.) removed from the waste wood. The wood fibre is firstly mineralised, which turns it inert. 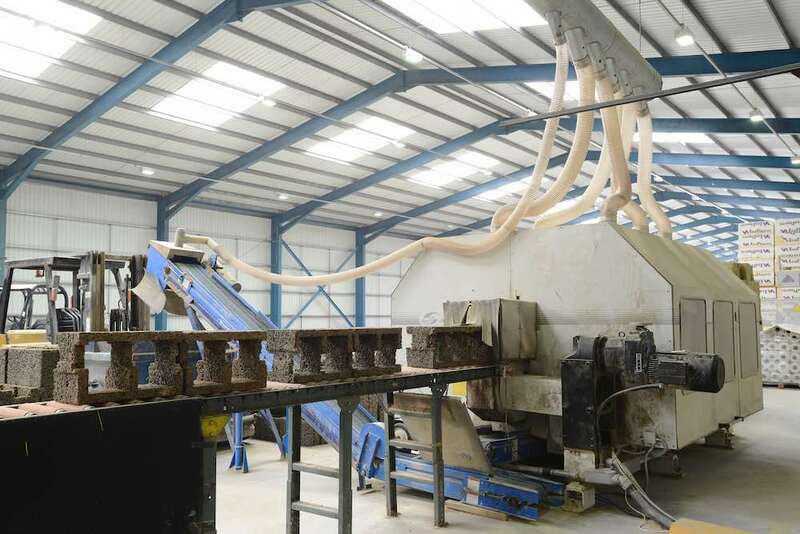 The wood fibre is then mixed with cement in a concrete batching plant which has been specially adapted for this process. The resulting woodcrete is then transported to the machine which stamps out the Durisol wall form units. It takes approximately 40 seconds to stamp out one set of blocks (a set of blocks consists of 8 – 16 blocks depending on the size required). The Durisol wall form units are laid out on the factory floor and covered with polythene. This stops the water in the mix evaporating whilst the chemical reaction between the materials sets the block units. This chemical reaction produces so much heat that the manufacturing facility does not require any heating. It takes approximately 24 hours for the wall form units to set on the floor after which time they are picked up with hydraulic grabs and transported to an interim storage area to continue curing. Three days later the wall form units go through a trimming process which ensures they are within a very tight tolerance of 250mm high. Once an order has been placed the wall form units are insulated and wrapped on a pallet to await delivery. To ensure they are properly cured the wall form units must be at least 30 days old prior to delivery.